optimal care to every patient, every time. 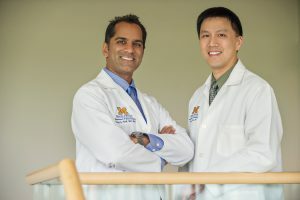 Our STIM (Surgical Therapies Improving Movement) Program, co-directed by Dr. Patil and Dr. Kelvin Chou, brings together a team of medical experts who are leaders in their respective fields and on the cutting-edge of the latest research to treat movement disorders. For carefully selected patients with Parkinson’s disease, Essential Tremor, and Dystonia, deep brain stimulation (DBS) can provide a therapeutic option that reduces or eliminates troubling motor symptoms and greatly improves quality of life. At Michigan, we are proud to have one of the best DBS programs in the country. Dr. Patil and the team have developed a wide array of improvements to DBS, including special imaging tools that help doctors more accurately place the electrodes, and intraoperative motor and speech testing that results in fewer side effects for the patient. Our team is continuously developing new techniques to improve outcomes for our DBS patients. Our Pain Neuromodulation Program provides a comprehensive and technologically advanced approach to the treatment of pain. Dr. Patil works in a team with pain anesthesiologists, neurologists, and physiatrists. Treated conditions include, but are not limited to: facial pain, back or leg pain, headache, complex regional pain syndrome, and peripheral nerve pain. Treatment options include oral medications, implanted pumps for infusion therapy, nerve stimulation, spinal cord stimulation, motor cortex stimulation, and deep brain stimulation. Spinal cord stimulation and peripheral nerve stimulation are two types of electrical nerve stimulation that can be used to treat chronic pain. Failed back surgery syndrome, cervical and lumbar radicular pain, neuropathy, and complex regional pain syndrome are some conditions that may be greatly helped by neuromodulation. Patients believed to be good candidates for neuromodulation therapies typically undergo a one-week trial of the therapy prior to permanent implantation of the device, allowing us to better predict long term outcomes without having to undergo a significant surgery. Trigeminal neuralgia is a chronic pain condition that affects the trigeminal or 5th cranial nerve, one of the most widely distributed nerves in the head. This painful condition may be treatable sometimes with oral medications. However, for patients with uncontrolled trigeminal pain, surgical procedures may alleviate or even eliminate symptoms. Common surgical procedures to treat trigeminal neuralgia, performed by Dr. Patil, include microvascular decompression, radiofrequency ablation, and glycerol injection. In addition, trigeminal nerve stimulation or thalamic deep brain stimulation can restore quality of life and improve pain in some patients. Microvascular decompression is an inpatient surgery that is very effective for the treatment of classic trigeminal neuralgia. The surgery involves making an incision behind the ear and exposing the trigeminal nerve. Using a microscope, vascular compression is relieved with the placement of padding between the nerve and the impinging blood vessels, so that they no longer irritate or compress the nerve. Radiofrequency ablation and glycerol injections are both minimally invasive percutaneous, outpatient procedures. Radiofrequency rhizolysis creates a precise amount of numbness to quiet nerve fibers that carry pain signals to the brain. Glycerol works by injection into the fluid around the ganglion of the trigeminal nerve, instead of numbing fibers within the nerve. As witness to a close friend with cancer who suffered enormously, Dr. Patil is dedicated to the alleviation of pain for cancer survivors. Fortunately for patients with cancer who suffer from significant pain despite taking oral medications, we have numerous surgical strategies to improve quality of life. We offer implanted pumps that deliver pain medication directly to the nervous system, drastically reducing side effects. In addition, Dr. Patil is an internationally recognized expert in a wide array of minimally invasive surgical procedures that block pain pathways from sending signals to the brain. Percutaneous radiofrequency cordotomy is a highly effective surgical intervention. The procedure involves using intraoperative CT guidance to place a needle into the spine and lesion/disable pain conducting nerve pathways to the brain. The procedure eases suffering, since patients have reduced capacity to sense pain in the treated region. Not every patient with a brain tumor requires surgery. Our Brain Tumor program takes a team approach, utilizing the expertise of neurosurgeons, neuro-oncologists, radiation oncologists, pathologists, and radiologists, to help each patient make the best treatment decision. We believe in taking an optimistic, open, and hopeful approach to brain tumor treatment. For patients who require surgery, Dr. Patil has extensive experience and specialty training in the safe removal of tumors in otherwise dangerous brain locations. Some tumors are located in areas of the brain where speech or movement functions are located. These are called “eloquent cortex” tumors. For these tumors, Dr. Patil may perform part of the surgery with the patient awake, to allow more accurate testing, maximizing patient safety during the operation. When spinal disorders cannot be treated with conservative measures, patients may need surgical intervention to correct these issues. Dr. Patil treats patients with a wide range of spinal conditions including tumors, trauma, degenerative disease, and Chiari malformation. Commonly performed spinal operations include laminectomy, discectomy, and fusion procedures. Surgeries range from minimally invasive surgeries performed through a small tube to more complex open operations that reduce nerve compression and stabilize regions where the spine moves abnormally. Chiari malformation is a congenital lesion in which the flow of spinal fluid from the skull to the spine becomes blocked. Patients with Chiari malformation may experience headaches, unsteady gait, and swallowing difficulties, depending upon the severity of the blockage. Surgical decompression allows cerebrospinal fluid to flow, thereby relieving disease symptoms.